In my previous article on Gold-Eagle.com I argued that the gold’s bear market may still be in effect and how this idea could have helped us to set up our investing & trading plan. 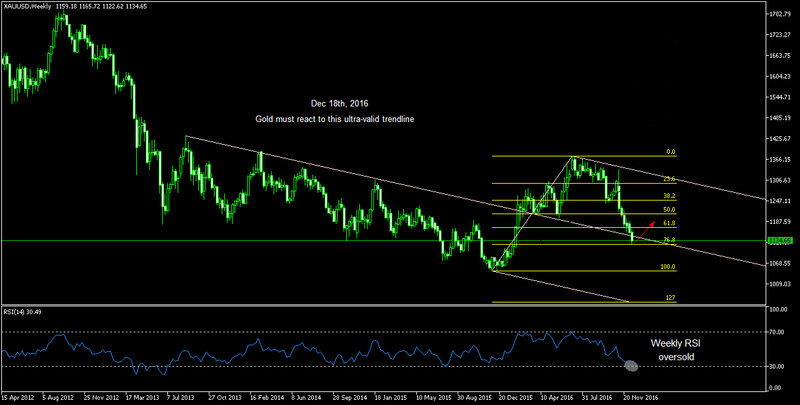 Since the Election Day, gold has come a long way in a short time and there are indications which point to a high probability for a bounce in the price of Gold during the course of this week. 1. 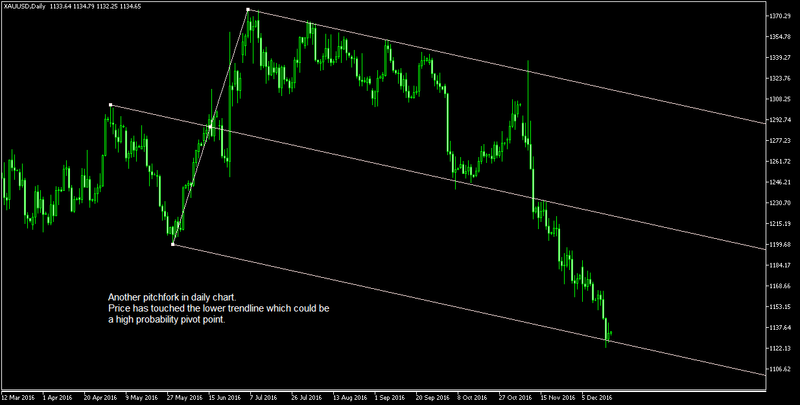 I often use trendline analysis methods and Andrews pitchfork is my favorate static trendline analysis tool. As you can see in the chart above, the 2016 rally broke one of gold’s ultra-valid bearish trendlines and now, we can see the price is testing this trendline again (median line). It is obvious that this trendline has been working well and shall be regarded as a high probability Support level for the price. Also we can see that the price has reached the lower trend line of the andrews pichfork on the daily chart (below) which could be a high probability pivot point. 2. We were expecting the price to bounce from the mighty 61.8% Fibo level but it did not happen. This gives the 76.8% Fibo level a higher potential to act as a short-term support. 3. The oversold reading of gold’s weekly RSI is a very strong signal. The coincidence of above-mentioned indications is significant since they represent three diferent methods for finding Supoort and Resistance levels in the price; static trend lines, Fibonacci levels and momentum indicators. That is why we have already issued an alert to our clients to act accordingly. Of course if 76.8% Fibo level does not hold (not likely), then this analysis will not be valid anymore. Ramin Kondori is a recognized Markets Technical Analyst from Iran. He is an IUT graduate in Civil Engineering and holds PG-Diploma in Welding Engineering. Since 1993, his fascination with gold and stock markets has led him to undertaking intensive studies and trading, parallel to his engineering business in the oil and gas industry. He also manages separately managed accounts for individual clients and is dedicated to helping investors boost their investment performance. Being a Quality Management professional, he has adopted a set of his own Investment Quality Assurance And Control Principles, which have proved to perform satisfactory results in the extremely risky financial markets of Iran.